You know the feeling... the ravenous grumble that's strong enough to make you push people down public transit steps or even curse your adorable dog because he needs to be walked. You're hungry for dinner and you're friggin' tired from working all day. Some may maintain enough composure to come up with dinner after a long day, but I lack the creativity. That's why I plan all of my meals for the week on Sunday. A little planning ahead helps me finish up time-consuming prep work and allows me to be somewhat mindless Monday through Friday. A little Sunday prep work. Not hard stuff, just needs a bit of time in the oven. Roast cut side down in the oven for 45 minutes, cool and then store in the shell for up to three days. For night of prep I pulled some leftover marinara from the freezer and found some prepared Italian sausages from the store. Use a fork to scrape out the insides. Isn't the texture marvelous? Not to mention so much healthier than traditional pasta. 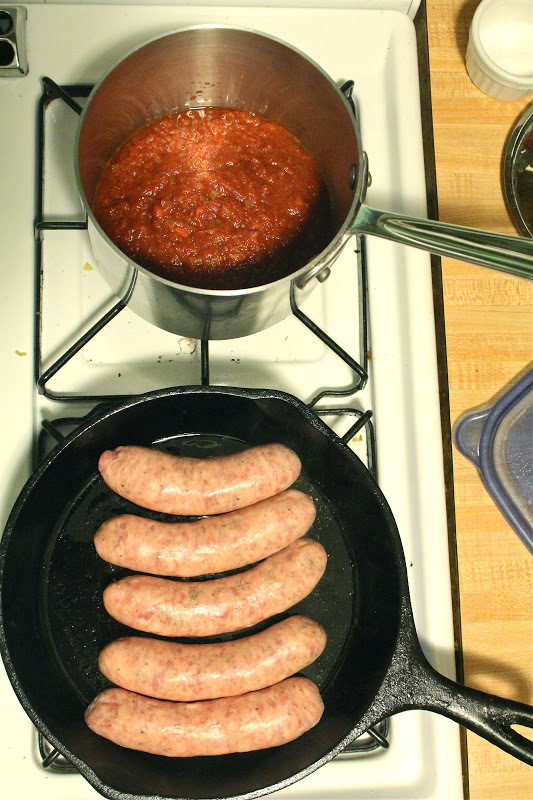 Sauce warms and sausages brown in 10 minutes. 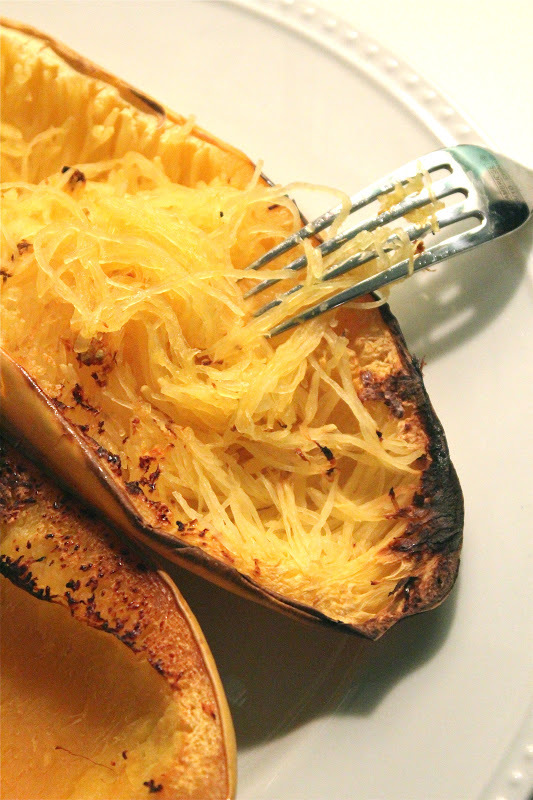 Warm up the leftover squash and serve. Be sure to apologize to the poor sap you pushed down the stairs too. Preheat oven to 400 degrees. 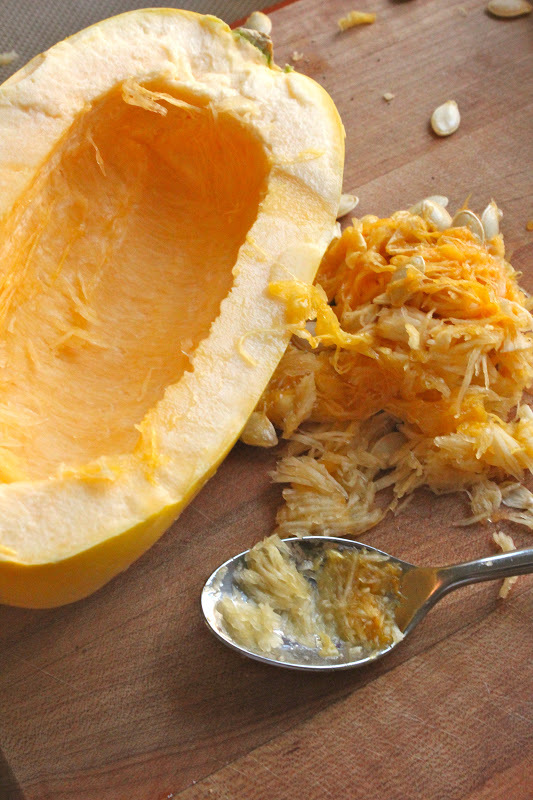 Split squash and scrape out seeds from inside. Place cut side down on cookie sheet and roast 45 minutes, or until tender. 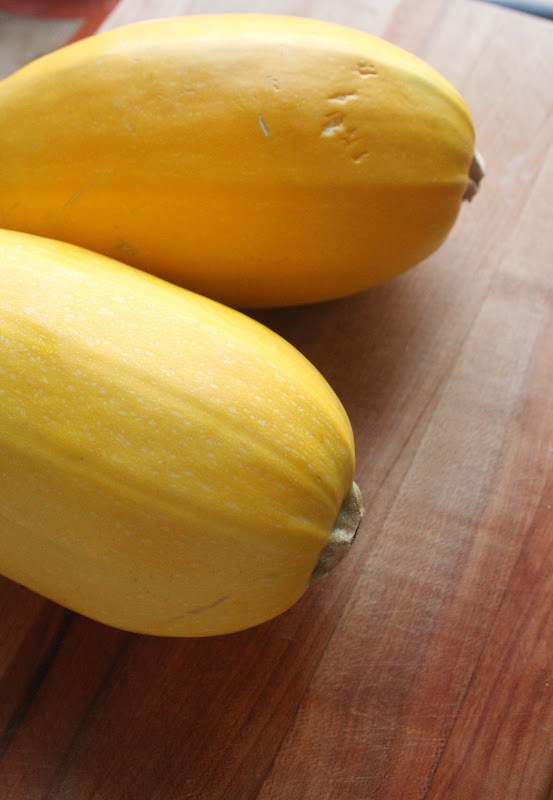 Allow squash to cool and refrigerate in the shell for up to three days. Warm olive oil over medium heat and add sausages. Brown for three minutes on each side, add a few tablespoons of water and cover immediately. Continue to heat, covered, until sausages are cooked through. Warm marinara over low heat on the stove. Scrape squash from shell and reheat in microwave. 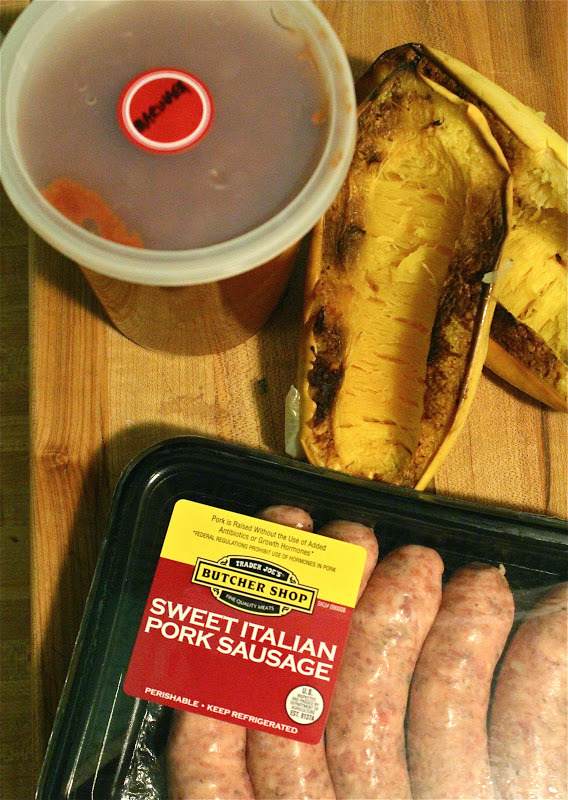 Serve squash with sausage and marinara.